It was only fitting that former Miami goaltender, Jeff Zatkoff, notch his NHL first win in a town where he and the RedHawks have been so successful over the years. The 26 year old Miami alum from Detroit, Mich. made 19 saves to record his first career win shutting out the Columbus Blue Jackets 3-0 behind goals from Derek Engelland, Jussi Jokinen and former Ferris State Bulldog, Chris Kunitz. The win moves Zatkoff’s season record to 1-2 with a 3.35 GAA and .865 save percentage as he has largely seen the pine behind Penguins starter Marc-Andre Fleury. Fleury, who is 10-2 and has played 12 of Pittsburgh’s first 15 games, collected the victory on Friday as the Penguins swept a home-and-home series from their new division-mates. With the loss, the bumbling Blue Jackets slip to 5-8 and have started what was supposed to be a breakout season very slowly. Congratulations, Jeff, and Love and Honor! Here’s to many more victories in the future! Zatkoff entered the 2008-09 season as the third in a triumvirate of goaltenders who would battle for supremacy in Los Angeles. One year later, with Quick established early as the starter in Los Angeles and Bernier a small step behind, Zatkoff has slightly fallen out of the picture. When taking Ersberg into consideration, the two roster positions in Los Angeles and the starting position in Manchester appear to be settled for another year, leaving Zatkoff as either a backup in Manchester or the starter for yet anotherECHL campaign. He might have the talent to be a serviceable goaltender in the NHL, but with so many other options available to the Kings, there is a lot for Zatkoff to overcome to get his chance in Los Angeles. The next tier of defensive prospects is headed by Martinez – a mobile and positionally sound defenseman. While no single aspect to his game stands out above the rest, his solid all-around game allows him to be quietly effective in both ends of the ice. 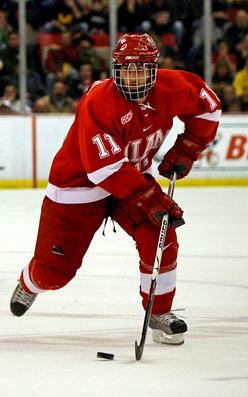 Martinez concluded his first season of professional hockey after leaving Miami University early. Scoring 23 points for Manchester, Martinez was a consistent contributor to the team even if not reflected immediately on the score sheet. Like Davis Drewiske, there is a good likelihood that Martinez will carve out a career for himself in the NHL in someone’s third pairing, but he has more offensive skills and so a slightly higher position in these rankings. > – Carter Camper has been named the RBC Player of the Month for December. The sophomore led the RedHawks to a 4-0-0 record in December and tallied four goals, and six assists, finishing with a +7 rating. – Hockey’s Future has published the AHL prospects update for the Los Angeles Kings organization and both Alec Martinez and Jeff Zatkoff are included. Martinez is the more mobile defenseman of the group, but has been slow to adjust to the AHL. One of the better offensive-minded defensemen in college hockey last season, Martinez needs work on aspects of his offensive game to retain his reputation. If he can begin to find the back of the net with a little more regularity, the Monarchs might be set offensively from their blueline with the combination of Martinez and Voynov. Accompanying the promotion of Quick to Los Angeles was the promotion of Jeff Zatkoff to Manchester from Ontario of the ECHL. Zatkoff was enjoying an all-star season for Ontario as a rookie goaltender, placing third in the league in save percentage. Now acting as the backup netminder for the Monarchs, he is still at least a year away from earning a consistent opportunity in the AHL as it would be difficult to imagine that the Kings would sit Bernier for any extended period of time absent a complete collapse in his game. – Speaking of Zats, he earned his first AHL victory on Wednesday night, with a 3-2 win over the Providence Bruins. Zatkoff made 29 saves for the Monarchs, who improved to 17-16-0-5 with the win. – And finally, the always popular PairWise Rankings and Ratings Percentage Index have been released over at US College Hockey Online. The Redhawks are currently 7th, with a PWR of 18 and and an RPI of .5574, good enough for a 10th place ranking. I’ll explain PWR and RPI more in-depth as we get closer to the NCAA tournament selection in March. >- Not a good weekend for the RedHawks. A fourth place finish in the Ohio Hockey Classic, with losses to Clarkson and Army. Who’d have ever thought? Miami is now 4-4-2 all time in the OHC and was the first time since 2004 that the ‘Hawks have lost consecutive non-conference games. Army scored two shorthanded goals and Clarkson scored two powerplay goals. From all reports, the special teams play simply called in this weekend. This team needs a bag skate and a lot of work this week before a tough series in Ann Arbor next weekend. Enough said. By the way, Ohio State won The Classic, with a 2-0 victory over Clarkson. – Defenseman Mitch Ganzak was a -1 in his debut with the Norfolk Admirals tonight. – Jeff Zatkoff took his second AHL loss in as many games in a 2-1 loss to Grand Rapids on Saturday night. Zats is now 0-2 in the “A” with a 2.53 GAA. > The good news continues for Jeff Zatkoff today, as he was named to the National Conference roster for the 2009 ECHL All Star Game. Zatkoff put up impressive numbers this season with the Ontario Reign, posting an 8-6-1 record, with a 2.39 goals against average; numbers that are second best in the ECHL. Currently, he’s with the Manchester Monarchs of the AHL. In his only appearance, the Chesterfield, MI native Zatkoff is 0-1, with a 3.05 GAA. The 17th annual ECHL All-Star game takes place on January 21, in Reading, PA. Rosters for the American Conference, will be announced later today. – Foxsports.com has compiled a list of the top ten NHL trades of the past year. 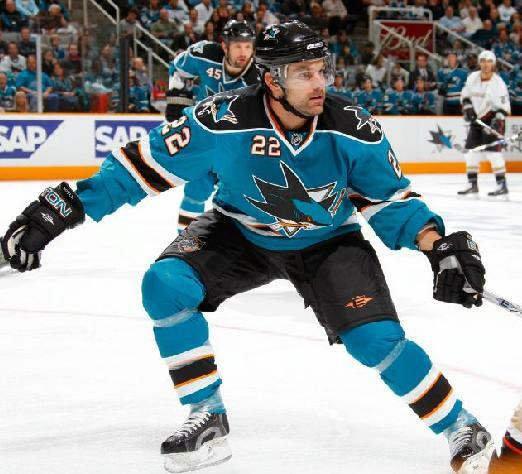 Featured on the list is Sharks’ defenseman Dan Boyle, who comes in at number two on the list, after being acquired from the Tampa Bay Lightning in July. – Randy Robitaille has been selected to play for Team Canada’s Spengler Cup team. The Spengler is the second oldest international tournament in the world and is held in Davos, Switzerland. The first winners of the Cup were the Oxford University Ice Team, in 1923. You can read the rest of the article and check out the rest of the rosters by clicking here. > – The Manchester Monarchs have announced that they have called up goaltender Jeff Zatkoff from Ontario of the ECHL. This is due to Jonathan Quick’s call up to Los Angeles, under emergency conditions. – The RedHawks has moved up to number two in the latest USCHO Division I poll. Other CCHA notables are Michigan (12), Nebraska-Omaha (16) and Alaska (18). – Still no official word tonight on Nino Musitelli’s reported shoulder injury. He hasn’t been placed on the IR as of yet. – The New Jersey Devils have taken defenseman Andy Greene off of the injured reserve list, after recovering from a broken hand. Greene may return tonight, against Toronto, or tomorrow night, when the Devils take on the Sabres. – After a six point weekend against RPI, sophomore forward Carter Camper has been named as one of the CCHA Players’ of the Week. 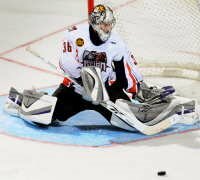 >– NHL.com has a nice article about the impressive performance of Jeff Zatkoff, for the ECHL’s Ontario Reign. These days, it’s the Los Angeles Kings who are far from mad with Zatkoff, who was selected in the third round by the club in the 2006 Entry Draft. Playing in his first professional season, Zatkoff is 7-6-1 with a 2.47 goals-against average and a .929 save percentage for Ontario, which is the Kings’ ECHL affiliate. You can check the rest out at this link. – Ryan Jones has been sent back to the Milwaukee Admirals after being recalled yesterday by the Nashville Predators. Jones suited up for his 16th NHL game last night against the Columbus Blue Jackets, seeing 10:43 worth of ice time. Ontario Reign goaltender Jeff Zatkoff is the CCM Vector ECHL Rookie of the Month for October. 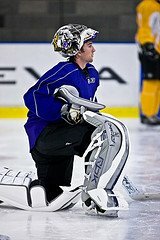 Selected in the third round (74th overall) by Los Angeles in the 2006 NHL Entry Draft and under NHL contract to the Kings, the 21 year old was 4-1-0 with a goals-against average of 2.20 and a save percentage of .935 as the Reign began their inaugural season 4-2-0. He won his first professional game by making 29 saves in a 2-1 win at Bakersfield on Oct. 18. He improved to 3-0-0 after making 28 saves in a 4-2 win at Las Vegas on Oct. 23 and stopping 34 shots in a 4-1 win against Las Vegas in Ontario’s home opener on Oct. 25. He closed out the month making a career-high 37 saves in a 3-2 win at Phoenix. Zatkoff was named RBK Hockey ECHL Goaltender of the Week for Oct. 20-26 after finishing as runner up for the award for Oct. 17-19. He played the last three years at Miami University where he was 55-21-5 with seven shutouts, a goals-against average of 1.93 and a save percentage of .927 in 82 games. Way to go Zats! Hopefully, Manchester isn’t too far off!